What could be better than spending the day having fun, getting messy outdoors with your family and being paid for it?? That’s exactly what our model family ‘The Burtons’ were selected for! 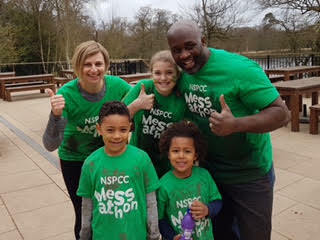 The Models Direct Assignments team were contacted by a production company who were filming a promotional video for the NSPCC’s latest campaign, the #Messathon looking for a model family to star in the video. The Burton family were successfully selected and had to spend the day outdoors, getting messy and having fun while being filmed – what a lovely day! AND they were paid for it! Modelling might not be the first thing you think about when you are pregnant, however there’s a big demand for Maternity models! Starring in my first commercial for Models Direct! Our little model Radisson secured his first assignment landing the starring role in a commercial for a new nursing/sports bra – at 1 yrs old that’s a massive deal!